A liver surgeon accused of branding his initials into a patient's liver has resigned after a disciplinary hearing. Simon Bramhall, who worked at Birmingham's Queen Elizabeth Hospital, told the BBC he had made a mistake and had apologised. The surgeon was suspended before Christmas following a claim he marked a patient. 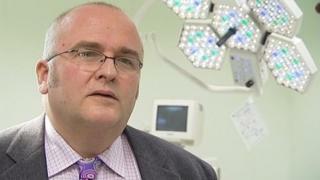 University Hospitals Birmingham said Mr Bramhall's resignation had been accepted. Mr Bramhall, a highly-regarded liver, spleen and pancreas surgeon, had worked in the Queen Elizabeth liver unit for 12 years. The decision to resign was due to the stress of the past five months, he said. He was suspended just before Christmas after the alleged branding was discovered by another surgeon. Liver surgeons use an argon beam to stop livers bleeding, but can also use it to burn the surface of the liver to sketch out the area of an operation. A highly placed source said it was not harmful to the liver and the marks normally disappeared. It appears the liver in question was otherwise damaged and as a result did not heal itself in the normal manner, allowing the marks to be seen. Part of the allegation was that Mr Bramhall signed his initials more than once. He told the BBC he had made "a mistake". He said: "I had a disciplinary meeting on 15 May. I was not dismissed. I made the decision on 16 May I would hand in my notice. It is a bit raw and I have to move on." The trust said: "During the course of an internal disciplinary investigation into the conduct of Mr Simon Bramhall, the consultant liver surgeon has tendered his resignation which has been accepted by the trust." Mr Bramhall came to attention in 2010 when he transplanted a liver saved from a burning aircraft into a patient.